Some analysts doubt whether China sees the EU as an important player on the world stage despite Europe's diplomatic charm offensive. "The EU-China strategic partnership is a partnership in name only. On many of the big issues that we have been observing in the last couple of years - climate change, financial regulation, nuclear proliferation, the Iran crisis - China has not treated the EU as a key strategic partner," Mathieu Duchatel, an analyst at the Asia Centre in France's Sciences Po university, told EUobserver. "The EU has not been able to transform its economic relations with China into any political leverage," he added. "There are very few countries which can influence China. The only country that has succeeded in recent years is the US." It’s to be noted by the lack of awareness that it is evident in a transcript of a leaked take from those fabled Copenhagen ”please pretend that we matter” summit. Angela Merkel expressed her frustration at India's representative who refused to commit to precise overall CO2 emission reduction figures. "Then you don't want anything legally binding!" she said, only to be countered by the Indian side: "Why do you make presumptions? That is not fair!" When she presented Europe's demand to have a commitment for a global reduction of 50 percent in greenhouse gas emissions by 2050, China's negotiator intervened abruptly and said: "Thank you for all your proposals. We've already said we cannot accept the long-term goal of 50 percent." At that point, French President Nicolas Sarkozy jumped in. "With all due respect and friendship for China," he said, the West had already committed itself to an 80 percent reduction by the mid-century mark. "And China, who will soon be the biggest economy in the world, now tells the world 'these engagements are for you, not for us.' This is unacceptable. One has to react to this hypocrisy," he scoffed. Because these countries are starting at a much lower per capita level of emissions, this would mean that the amount of carbon emissions allowed would ironically be higher for developed countries than for the third world. The rich world would be permitted two to five times higher per capita emissions than developing countries. Actually, it’s really not that hard to figure out where they get it. Not hard at all. Everything should be free in this life, right? Separately on Saturday, riot police in the German city of Hamburg broke up a march of a round a thousand young people mounted in solidarity with Greek demonstrators after the protesters attacked police units with bottles and fireworks. Neglected European Allies to Barack Obama: "We want to be heard, listened to, allowed to reflect together!" "We want to be heard, listened to, allowed to reflect together!" Those words, declaimed by Nicolas Sarkozy before Columbia University's students in New York in late March on the eve of his dinner with Barack Obama, said aloud what a good number of European leaders are thinking to themselves regarding the first U.S. leader to describe himself as "America's first Pacific president." … In the American president's world vision, there is little affection for Europe. European allies feel neglected by Barack Obama, writes Natalie Nougayrède in a Le Monde. article in which she goes over some of the Obama's snubs to the Europeans, intended or otherwise (sending the Churchill bust back to Britain, the unilateral retreat of Eastern Europe's missile defense shield, the refusal to attend the 20th anniversary of the fall of the Berlin Wall, etc), as well as conservative criticism of the Apologizer-in-Chief's be-snotty-to-our-allies-be-kind-to-our-enemies doctrine. En novembre 2009, M. Obama a fait l'impasse sur la cérémonie des vingt ans de la chute du mur de Berlin, après avoir jugé qu'en revanche sa présence était indispensable pour défendre à Copenhague la candidature de Chicago aux Jeux olympiques. Le mois suivant, à Copenhague, il discutait avec les "émergents" du climat, sans que les Européens soient présents dans la salle. …Les détracteurs de M. Obama affirment toujours qu'il dialogue plus volontiers avec les ennemis de l'Amérique qu'avec ses amis. "Cette administration voit les Etats-Unis comme une puissance en recul dans le monde, commente Eric Edelman, l'ancien numéro trois du Pentagone sous George W. Bush, et elle semble penser que le seul pôle qui décline plus vite encore est l'Europe." • See also: Europeans "Shattered" by Obama's Indifference: "Bush Was Not the Problem, Obama Is Not the Solution"
Update: Barack Obama reaches out to …France's Muslims, in France's ghettos (! ), writes Corine Lesnes. Living in a comfortable and debt financed socialism for many years, Greece reacted with a mix of resignation and outrage on Monday to a painful austerity package from the government. It foresees a massive fiscal adjustment driven primarily by cuts in the country's bloated public sector, which makes up roughly a third of the workforce. Even if only on the terms of there eventually being no-one left to soak, Socialism always leads to failure, and usually results in a tumultuous or even violent collapse before you have any kind of “change you can believe in”. If the notion of not receiving state payments until you’re 65 draws comparisons with death, then you know where things are going. With 7 million more people unemployed today than two years ago, why is the GNP higher than it has ever been? Who was really working? First, you could layoff every green worker and many government workers (it has been done before) and no one would know the difference. We need to add in all the people who complain about their jobs, nearly everyone who has a job based solely on union rules and everyone who works for an incompetent supervisor or manager. in other words, people whose role in the economy (and society when you think about how that imputes,) is meaningless. ....you know that consistency is not their bag, collectively speaking of course. So Greece has had its debt downgraded. What an opportunity for profit for the financial markets. What a disaster for the people of Greece. And what a triumph for Standards and Poors. Amazing. Standard & Poors undertsand that the only way out of a recssion is to spend. If you don’t - as Greece will not be allowed to do - then the recession deepens into depression - as Greece’s surely will - debt becomes harder to repay - social crises follow - fascism is welcomed in after that - and hey presto, we have the 1920s and 30s all over again. On what evidence they can say this is beyond me. The White House has been late AND incompetent on the issue, but are managing to elicit sympathy from the US media, and even the foreign media. Gosh. I wonder how THAT happens for people of one political persuasion while the opposite gets precisely the opposite, AND a passing complaint that ”Faux News” is biased, and must be banned in the interest of free speech, etc., etc., etal. In fact, the main export to the EU from five of the seven countries that make up the Central African region (Cameroon, Chad, the Democratic Republic of Congo, Gabon and Equatorial Guinea), is oil. In particular, crude oil represents 88% of Equatorial Guinea’s exports to the EU. And, of course, the places that THEY get their oil from has never had a spill, bad social consequence, or otherwise. Just the very fact that they’ve overturned regimes in Africa for oil, propped up dictators for it... none of this bears mentioning. But if it doesn’t fit their ideology, and the single example that has been hammered into their heads through endless repetition, then Hurricane Katrina MUST be mentioned if the subject of the US comes up, and if the love of their Führerprinzip craving lives is threatened, they will go out of their way to construct a way to fit an oil company into a Katrina-esque meme. After all – all is Katrina, but travesties that their simple minds have to work to understand are, well, assumed by omission to be just plain okay. ...fumes the Frankfurter Allgemeine Zeitung . But when politics consists in integrating countries and whole continents by sharing the prosperity, one is bound turn a blind eye to the financial unfeasibility of these noble aspirations – aka “cohesion” in Eurospeak. “Take away the life-lie from the average society and you take its political order, too,” to put a political spin on the line from Ibsen. These life-lies include all our rhetorical efforts to whitewash the fictions of rationality underlying our society. We are supposedly living in a society under permanent observation and surveillance, constant evaluation and certification. At any rate the agencies entrusted with those tasks get paid for that. We are supposedly living in a knowledge-based society, too. So why doesn’t anyone laugh at all that bunk? Not even the most flagrant political disasters are openly acknowledged till they can no longer be denied by the laziest glutton. Through complex cogitations we demonstrate that debts are investments in the future, that Europe is a great thing or that jet fuel, increased auto production, standby mode and subsidised cattle ranching can’t be the cause of climate change. It’s the Chinese and the Americans, we sigh – because the government has already sighed at them – who have finally got to get their environmental act together. And Greece has got to become credible. As credible as we are, as credible as the banks, talk show hosts, chancellors and Cretans. A Hezbollah rally in front of the Louvre Museum: Is Europe past the point of no return? A Hezbollah rally files down Paris's Rue de Rivoli, past the Louvre Museum (shookhran à Mark et François). Jesse Petrilla filmed this while on a trip to Paris. Scary stuff. This is in front of the Louvre where the Mona Lisa is. Hezbollah flags are seen throughout the rally. 2:50-3:30 - The ever present Arabic chant (heard at all these jihad demostrations) the genocidal Khaibar Khaibar ya yahud, jaish Muhammed sa-ya'ud--the chant reminding the Jews of Muhammad and his army's slaughter and mass beheading of the Jews of Khaibar, after they had surrendered. Share this and post this everywhere you possibly can. Violence started later that evening, a McDonalds was destroyed and several cars torched. Conservatives' Heroes: Are They Wretched Hypocrites with Nothing But Low, Treacherous Motives for Meeting Their Foes-To-Be Two Decades Earlier? 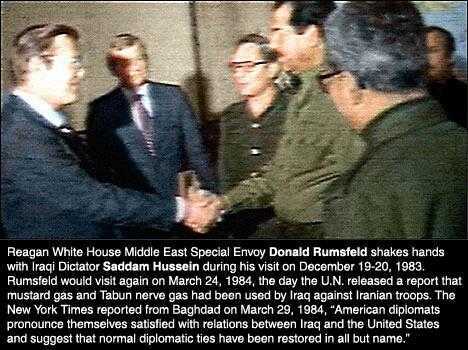 Remember the photo of Donald Rumsfeld meeting Saddam Hussein that was supposed to be, in and of itself, a damning condemnation of the Iraq War (which occurred 20 years (!) after a photo supposed to be indicative of the normal day-to-day diplomatic relations between two nations that were not at war at the time, not to mention photos far less prevalent than images of this type) as well as the last word on the Bush administration's — or on America's — alleged hypocrisy towards Saddam Hussein? What if I told you a photo existed of Winston Churchill meeting with… the German Kaiser?! Would that be a reason to condemn Winston, and/or the British Empire, for going to war with Germany either in the Great War (World War I) or in World War II? The menacingly regimented corridors, the depersonalized looking work areas that appear otherwise unoccupied, the mass of interns paid for their apparent enthusiasm... it’s the EU’s sputtering pace car on the info-bahn, its’ full time carney barker, and press operation serving an otherwise unmoved press corps. European Commission President Jose Manuel Barroso will travel to China this week (29 April - 1 May) for talks with Chinese Premier Wen Jiabao as the two sides look to map out a five-year co-operation plan. "We will seize this opportunity to generate positive momentum in our 35-year relationship and develop a far-reaching agenda for the next five years," Mr Barroso said in a statement on Monday. Actually they really aren’t an important global playa, but aside from that, the tone is enough to give one flashbacks. Western analysts say the Soviet Union’s sluggish economy may be hard pressed to attain even the pared-down production goals set out for 1980. The new year will mark the close of the current five-year plan, as Soviet officials strive to draw up the next master plan for guidance of the centrally controlled economy in 1981-1985. While Moscow commentators regularly harp on inflation, unemployment, and other woes in the West, sobering domestic figures for 1979 have made Soviet economists more cautious in assessing this country’s own performance. Western analysts in Moscow said the Soviet economy appeared to be slowing down to such a degree that in the coming years the Kremlin spokesman may have to quietly abandon their long-time preditions about the economy eventually overtaking the west. On a similar note, I hope Barrosso can account for what he meets along the way in China that cannot be criticized in the same way the United States can. Making that same “civilized, social growth” story to anyone, let alone a clutch of Chinese economists, makes them sound as silly as those Soviets saving fave. Europe has been harder hit than the U.S. by the economic crisis and is mired in spurious rhetoric, much of it in French, limning an illusory social-market variant to “cowboy capitalism.” This is like the Holy See’s ancient but sporadic search for a third way between socialism and capitalism. It is a vain pursuit of an economic system diluted by the imposition of self-indulgent European cultural fatigue, masquerading as gentility.